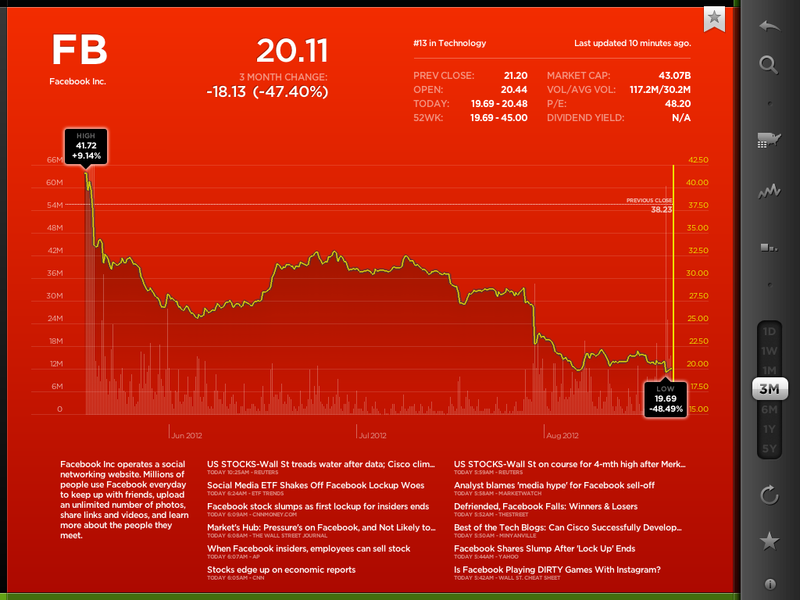 With the Facebook IPO coming up this Friday there is a lot of attention around its business model and financials. I’m not an expert in this area, but my hunch is that a lot of people will lose a lot of money by chasing after Facebook shares. Why? I think there are two types of answers. One from reasoning and one from intuition. For reasoning one needs to look at a more technical assessment of the business model and financials. Some have written extensively about the comparative lack of innovation in Facebook’s business model and core product. Some have compared Facebook’s performance in advertising to Google – the estimates are that Google’s ad performance is 100x better than that of Facebook. Some have pointed out that many of Facebook’s core metrics such as visits/person, pages/visit or Click-Through-Rates have been declining for two years and go as far as calling this the Facebook ad scam. One can question the wisdom of the Instagram acquisition, buying a company with 12 employees and zero revenues for $1B. One can question the notion that the 28 year old founder will have 57% of the voting rights of the public company. One could look at stories about companies discontinuing their ad Facebook efforts such as the Forbes article about GM pulling a $10m account because they found it ineffective. The list goes on. To value a startup at 100x last year’s income seems just extremely high – but then Amazon’s valuation is in similarly lofty territory. As for reasoning and predicting the financial success of Facebook’s IPO, people can cite numbers to justify their beliefs both ways. At the end of the day, it’s unpredictable and nobody can know for sure. No Apple = no iPhone, no iPad, no iTunes music on the iPod or via AppleTV on our home stereo. That would be a dramatic setback. No Google = no Google search, no GMail, no YouTube, no Google maps, no Google Earth. Again, very significant impact for me personally. Not to mention the exciting research at Google in very different areas such as self-driving vehicles. No Facebook = no problem (at least for me). I deactivated my own Facebook account months ago simply because it cost me a lot of time and I got very little value out of it. In fact, I got annoyed with compulsively looking at updates from mere acquaintances about mundane details of their lives. Why would I care? I finally got around to actually deleting my account, although Facebook makes that somewhat cumbersome (which probably inflates the account numbers somewhat). I’m not saying Facebook isn’t valuable to some people. Having nearly 1B user accounts is very impressive. Hosting by far the largest photo collection on the planet is extraordinary. Facebook exploded because it satisfied our basic need of sharing, just like Google did with search, Amazon did with shopping or eBay did with selling. But the entry barrier to sharing is small (see LinkedIn, Twitter or Pinterest) and Facebook doesn’t seem to be particularly well positioned for mobile. I’m not buying the hype. What am I missing? Let me know what you think! What started as a $100b market valuation is now at $43b. One has to hand it to Mark Zuckerberg, he really extracted maximum value out of those shares. It turns out sitting on the sidelines was the right move for investors in this case.